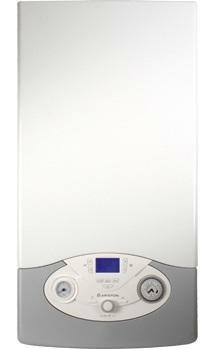 The CLAS HE SYSTEM EVO is a system gas boiler with an output of 18kW. This boiler is a highly efficient and money saving model. It’s an A rated boiler for heat and has an efficiency rating of 90.1%. It comes with a stainless steel heat exchanger and a built in automatic by-pass to help the water keep on flowing. As well as this it has an auto-diagnostic system to help you know what is wrong in the boiler, in the unlikely event that it will go wrong. There is a range of wired and wireless controls available for this model. Auto function technology helps to ensure you get maximum energy efficiency as well as offering energy savings. When auto function is on the boiler will choose the output for your heating and gradually increase the power until your home has reached a comfortable temperature. This boiler also comes with three temperature zone capability when used with sensys controller, and as well as this it comes with an anti-frost device which helps protect your boiler through the cold wintery days. The CLAS HE SYSTEM EVO is extremely compact and quiet. It can be converted from LPG to natural gas using a conversion kit. This boiler is also available with the output options of 24kW and 30kW. It has a 5 year warranty but it is also available with 8 or 12 years at an extra cost.